The City of Melbourne is workshopping the idea of a temporary inner-city public space with the creation of a pop-up park on the eastern side of Elizabeth Street for pedestrians over summer. Plans for a permanent park at the intersection of Flinders and Elizabeth streets have been postponed to accommodate the construction of a $40 million office building at 276 Flinders Street. The 376 square metre space will feature trees, planter boxes, artificial turf, and moveable furniture designed by the City of Melbourne's in-house design studio. 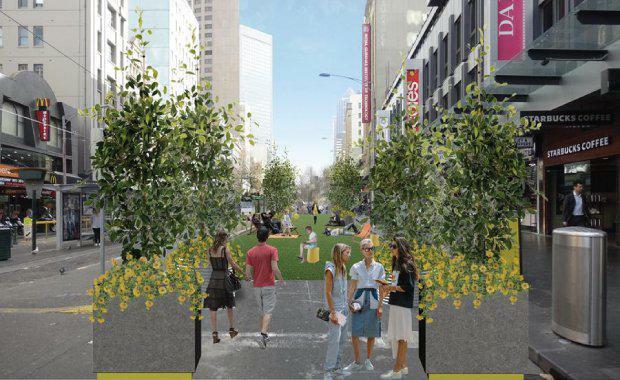 “We expect the pop-up park to be well used by the pedestrians who access the corner of Elizabeth Street and Flinders Street during the peak periods," Lord Mayor Robert Doyle said. According to the City of Melbourne, footpaths in this area of Elizabeth are accessed by more than 9,300 people in the morning peak, while car use has declined to a mere 73 vehicles at peak time. Between 2004 and 2015 there was a 65 per cent decline in the number of motor vehicles using Elizabeth Street. Despite the "pop-up" description for the park, the initiative is in fact a prelude to a more permanent park facility set to be built in 2019 which will see $2.2 million worth of work invested in new street furniture, better lighting, new bluestone paving, drainage improvements and trees. [Related reading: $350 million Tower Melbourne Officially Scrapped]Park construction has been put on hold during the redevelopment of a former bank site at 276 Flinders Street into a new commercial asset with a 16-storey office tower, three new retail podium levels and redeveloped childcare facilities. The next stage of the Fivex development -- to begin in February 2018 -- comprises a five level office building in lightweight steel and timber with sustainable features. “The transformation of this former bank site will provide an additional 4,000 square metres of new in demand office space for Melbourne,” the Lord Mayor said. “The decision to postpone construction of the permanent public space is based on maintaining pedestrian safety around construction activities and allowing this important development for our city to get underway. "Fivex managing director Lesli Berger said their commercial development will provide a valuable economic boost to the area while the street upgrade will improve public amenity on Elizabeth Street. “We’re fully supportive of the permanent closure of the eastern side of Elizabeth Street. The combined impact of our $40 million development and the partial road closure will bring added vitality to an area that is such an important pedestrian gateway for the city,” Berger said. The City of Melbourne released renders of the new park which will be open from December 2017 to February 2018.